There are 1082 articles specifically referring to this gene in PubMed. 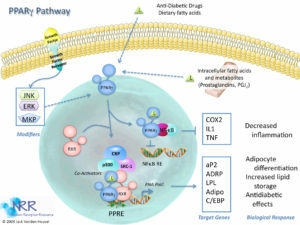 Functionally, the gene has been tested for association to diseases (Adenocarcinoma; Adenoma; Alcoholism; Alzheimer Disease; Anemia, Aplastic; Aortic Valve Stenosis; Arteriosclerosis; Arthritis, Rheumatoid; Asthma; Atrial fibrillation and 64 others), proposed to participate in pathways (Basic mechanism of action of PPARa PPARb(d) and PPARg and effects on gene expression, Huntington's disease, Pathways in cancer, PPAR signaling pathway, Role of PPAR-gamma Coactivators in Obesity and Thermogenesis, Thyroid cancer, Visceral Fat Deposits and the Metabolic Syndrome) andprocesses (brown fat cell differentiation, cell fate commitment, epithelial cell differentiation, long-chain fatty acid transport, negative regulation of acute inflammatory response and 18 others). Proteins are expected to have molecular functions (chromatin binding, DNA binding, metal ion binding, promoter binding and 6 others) and tolocalize in various compartments (cytoplasm, nucleus, cytosol). Putative protein interactors have been described (AMPD1ANDDENND2CANDBCAS2, BRD8, CEP350, CNOT1, COPS5ANDLRRC67, CREBBP, DNTTIP2, EDF1, EP300, FABP1 and 36 others). PPARɣ Reporter Cells are prepared using INDIGO’s proprietary CryoMite™ process. This cryo-preservation method yields high cell viability post-thaw, and provides the convenience of immediately dispensing healthy, division-competent reporter cells into assay plates. There is no need for intermediate spin-and-wash steps, viability determinations, or cell titer adjustments. 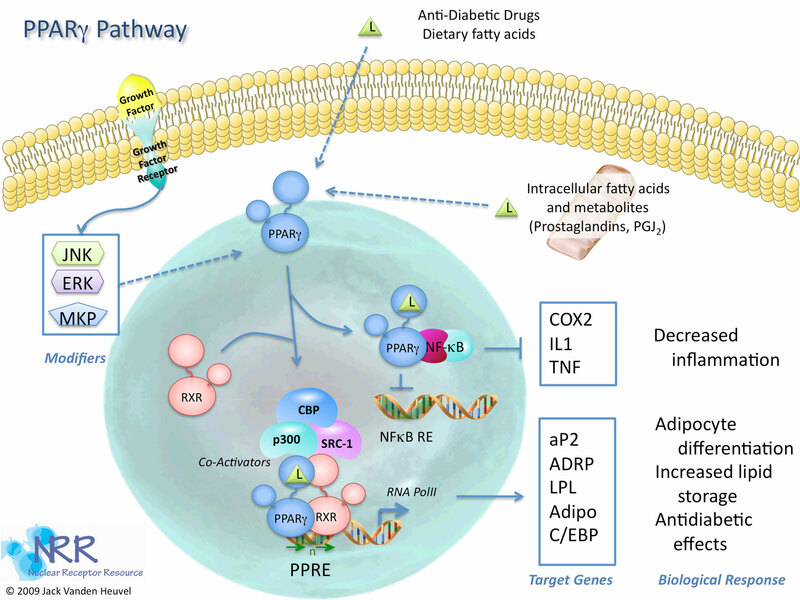 The principle application of this assay product is in the screening of test samples to quantify functional activities, either agonist or antagonist, that they may exert against the peroxisome proliferator-activated receptor. This kit product is an all-inclusive assay system that includes, in addition to PPARɣ Reporter Cells, two optimized media for use during cell culture and (optionally) in diluting the test samples, a reference agonist, Luciferase Detection Reagent, a cell culture-ready assay plate, and a detailed protocol. The gene contains 17 distinct gt-ag introns. Transcription produces 12 different mRNAs, 11 alternatively spliced variants and 1 unspliced form. 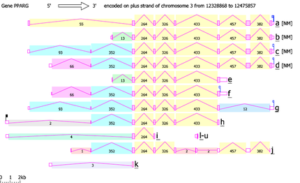 There are 5 probable alternative promotors, 2 non overlapping alternative last exons and 8 validated alternative polyadenylation sites (see thediagram). The mRNAs appear to differ by truncation of the 5' end, truncation of the 3' end, presence or absence of 3 cassette exons, overlapping exons with different boundaries. 10 spliced mRNAs putatively encode good proteins, altogether 9 different isoforms (5 complete, 2 COOH complete, 2 partial), some containing domains Ligand-binding domain of nuclear hormone receptor, Zinc finger, C4 type (two domains) [Pfam]. 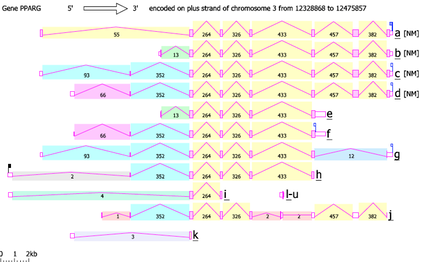 The remaining 2 mRNA variants (1 spliced, 1 unspliced; 1 partial) appear not to encode good proteins. 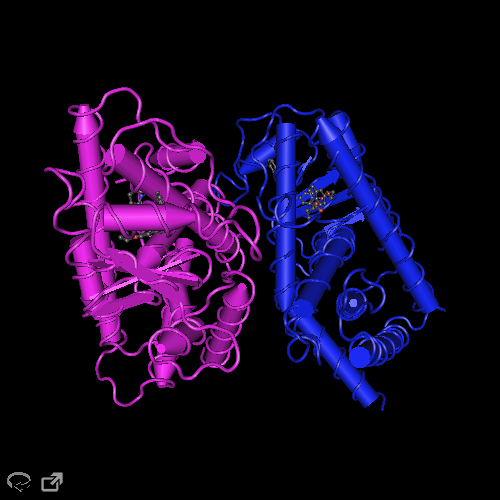 Finally proteins from this gene may be modulated by phosphorylation; sumoylation, as detailed at PhosphoSite.